My mil was recounting to my boys how raising five kids was no cakewalk. Shall I tell you the story about how your dad spilled two litres of oil in the living room, and how the cleanup took FOREVER? Or shall I tell you about your aunt nearly got kidnapped while coming back from school…? Or shall it tell you about I accidentally overdosed your eldest aunt with cough syrup and she didn’t awake for many many hours when she was a baby? Or shall I tell you about how your uncle swallowed a dice thinking it was vazhakai roast? “Yes that last story, paati,” asked firstborn. There was a long pause as they digested the story, grandma blasted out from the past. Only firstborn broke the silence with his rather pertinent q. We are in a kutchery. Firstborn, baby param and me. this is normally a recipe for fidget fidget fidget. It is a recipe for ‘how much longer till the last song’. The boys slouch and slump and yawn. I fear the day the musician on the stage is going to stop the song in mid gamaka and hold the exit door till my brood leaves. Today. Our favourite group is singing. It’s the girls from balabrundam headed by maami. Already my boys have agreed to attend the kutchery without major bribes. We know at least 10 people in the audience, some mothers, some fathers and some grandmas with their faithful sticks to hold on to. How much more beautiful some songs sound as we age with them.. The boys pick the second row. They have chosen VIP seats. It doesn’t go with my offline mouse persona. But I comply. We listen. I don’t have to say shush hundreds of times. They are lost when the mridangam vidwan checks for shruti. Baby param wants to know what’s going on? In a voice that half the hall can hear. A aargh! But one part of me knows that seetha mami understands. And the girls on the stage would tweak his ear, and leave it at that. And finally when it does … The music feels like home. My first iPad image on this blog. I seem to have cut off the mridangam and violin vidwans. I did tell you about this place, right? If mornings are filled with music, then evenings are for kalaripayattu..
My instrument is a 35 year body, that has reproduced twice, and is 65 kilos, and a stiffish spinal cord, a paunchy mid section, and thunder thighs. Sigh. I am in the midst of Carnatic music lesson, and trying to align my voice to the shruti box. My dad has already commented that the shruti box sounds rather like an MTC bus – criticism where is thy sting? Am singing despite the collective snideness , esp my akaaara sadhana draws out rather sharp reactions. But. This summer is going to be raining with my swaras. I like to go slow. I am the last one in the class who wants the new lesson. Revise revise revise = that’s my cup of rasam. 2 I only look at the teacher. This is terribly atypical. In all of school, and most of college I never would have given the teacher a single rose from my hair, or a single glance, or even the time of the day. And now it’s as if my classmates almost don’t exist. 3.out of the five notes that make mohanam I get only one right all the time, but the good news is that I am improving. 4 how useful an iPad is in the scheme of music listening when you are trying to internalise, memorise even. I am grateful to have this technology for the boys and me too… Play on loop is awesome. 5 am not terribly shy to sing aloud in the class, or mortified, or embarrassed or trying to hide behind a neem tree, feeling apologetic about my voice or singing talent. I am just out of breath, sometimes. 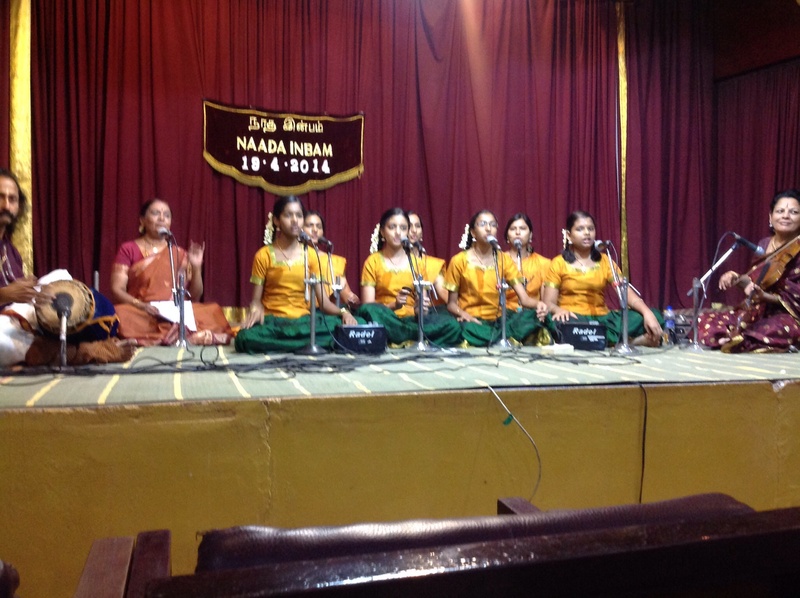 6 Carnatic music is voice gym. 7 never go to the music class wearing a tight blouse. The higher notes get impossible.